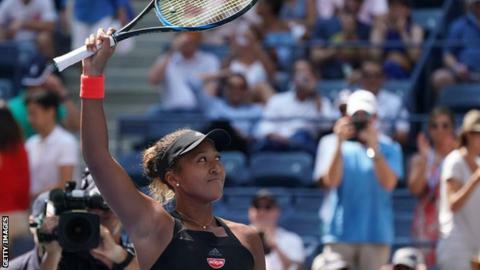 Japan's Naomi Osaka reached her first Grand Slam semi-final with a dominant victory over Ukrainian Lesia Tsurenko at the US Open in New York. The 20-year-old will play American 14th seed Madison Keys, last year's beaten finalist, after she defeated Spain's Carla Suarez Navarro 6-4 6-3. Osaka won 6-1 6-1 against her unseeded opponent in 58 minutes. "I was freaking out inside," said Osaka. "My entire body was shaking, so I'm glad I was able to play well." The 20th seed becomes the first Japanese woman to reach a Grand Slam semi-final since Kimiko Date at Wimbledon in 1996. Keys, beaten by Sloane Stephens in the final 12 months ago, is the highest seed left in the women's draw. "I felt good," she said. "Being out in front of an energetic crowd is always fun." Six-time champion Serena Williams faces Latvia's Anastasija Sevastova in the other semi-final on Thursday. Despite injuries holding her back on the WTA Tour this season, 23-year-old Keys has stepped up in the major tournaments by reaching at least the quarter-finals in three of the four Slams - Angelique Kerber is the only other woman to achieve the feat this year. And she had too much quality for 30-year-old Suarez Navarro, who was superb in beating Maria Sharapova on Monday. A single break was enough in each set, one in the final game of the first and another for a 4-2 lead in the second, for victory. There was a slight wobble as she produced a double fault on match point but, with the home crowd behind her on a noisy Arthur Ashe Stadium, Keys saved a break point before sealing victory when Suarez Navarro pushed a forehand into the tramlines. "I feel like last year a lot of my matches were kind of emotional roller coasters, and this year I feel like I have been much more solid mentally," she said. "In tougher times I'm keeping my cool a little bit better and not having to have the big emotional swing to kind of try to get back into matches. "I'm a lot less emotionally drained this year." Both Osaka and Tsurenko were competing in their first Slam quarter-final but the Ukrainian failed to settle and looked physically drained. Osaka, regarded as one of the best young players in the game, broke Tsurenko's first service game and powered to the first set in 26 minutes before racing into a 4-0 lead in the second. Tsurenko then held serve and brought up three break points in the following game but failed to convert and double-faulted twice in the final game to hand Osaka victory. Osaka did not celebrate the winning point following criticism of her reaction to her fourth-round win. "The other time I cried a little bit and a lot of people made fun of me," she said. American tennis legend Billie Jean King took to Twitter to defend the Japanese player. "Naomi Osaka - I'm terribly sorry you were teased for crying following your US Open victory. Never, ever be afraid to be your authentic self. #champion," tweeted King. Tsurenko said that poor health meant she was not in peak condition for the match. "I just woke up with a viral illness or whatever it is," the 29-year-old said. "I don't know what happened, but my throat is not well. I'm not breathing well."